At the end of a very rewarding afternoon that had Bob and I enthralled with the cave dwellings at Mesa Verde National Park in Colorado, we had to return to our base lodgings at Grand Canyon National Park in Arizona. 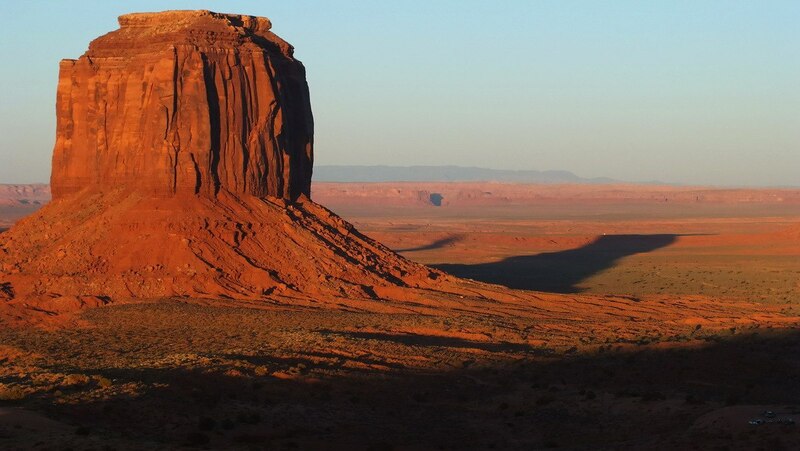 The drive took us right past Monument Valley on the border of Utah and Arizona, so we couldn’t pass up seeing the famous landmarks located there. 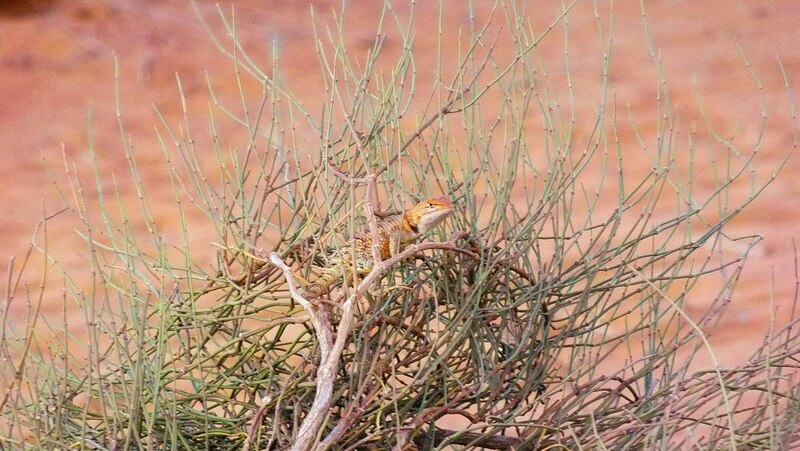 That is where we came upon this female Desert Spiny Lizard. We had managed to time our arrival perfectly to coincide with the sun as it sank towards the horizon, so a gorgeous rich, orange glow bathed the landmarks from top to bottom including Merrick Butte seen here. 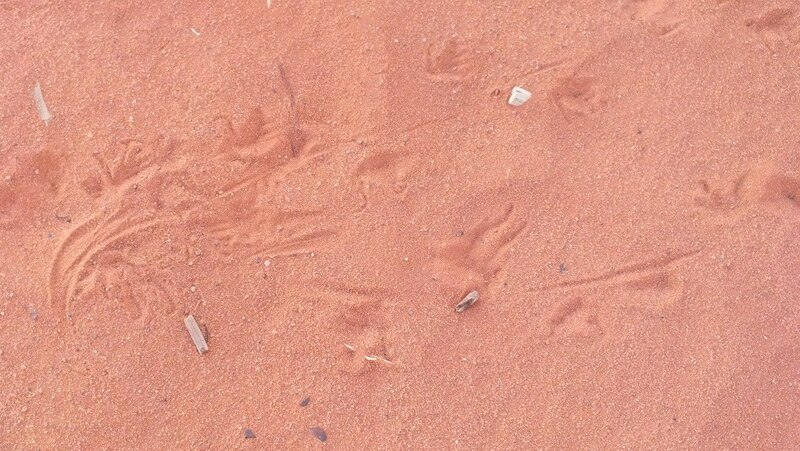 As Bob and I walked around the first look-off along Valley Drive in order to change our view of West Mitten and East Mitten Buttes, I took note of these interesting tracks in the fine red desert sand. I knew well enough that the tail of some critter had left the central indentation between the impressions made by the right and left feet. 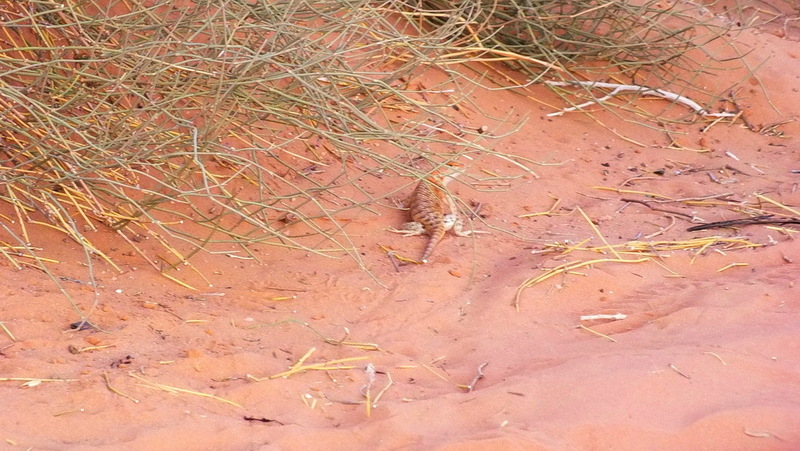 A cursory scout of the area soon had us discovering the source of the tracks in this diminutive Desert Spiny Lizard. Tucked beneath a few thin wisps of parched grass, the orange lizard blended almost seamlessly with the coral-coloured sand. Sunlight was dwindling so it became necessary to use the flash on our camera when the Desert Spiny Lizard retreated towards a dense mass of tangled branches. Turning towards us, the Desert Spiny Lizard revealed itself to be a female recognizable by the fact that its throat and belly show no indication of the telltale violet-blue wash seen on males of this species. Already, we had established that the tail exhibited no blue-green colour attributed to male Desert Spiny Lizards. 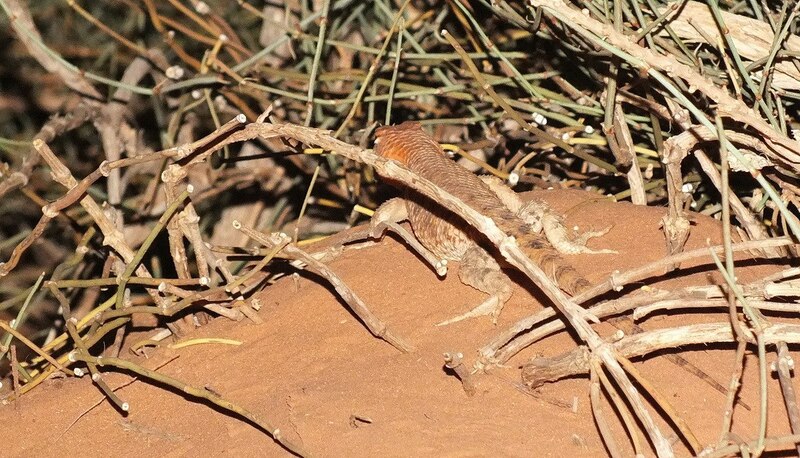 It is typical for these lizards to be found near some source of ground cover, be it a pile of rocks or wood. 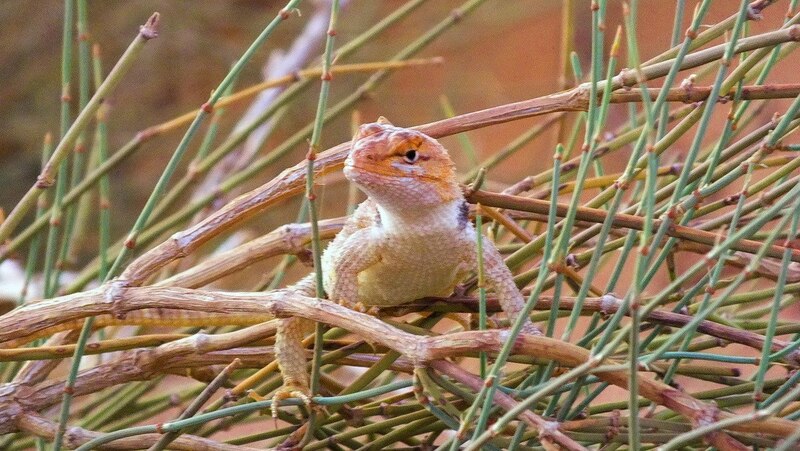 If a predator threatened the Desert Spiny Lizard, it would be quick to disappear down into a pack rat nest, rock crevice or a burrow, but in this case, the lizard scampered up the central thick stalk of a low shrub. 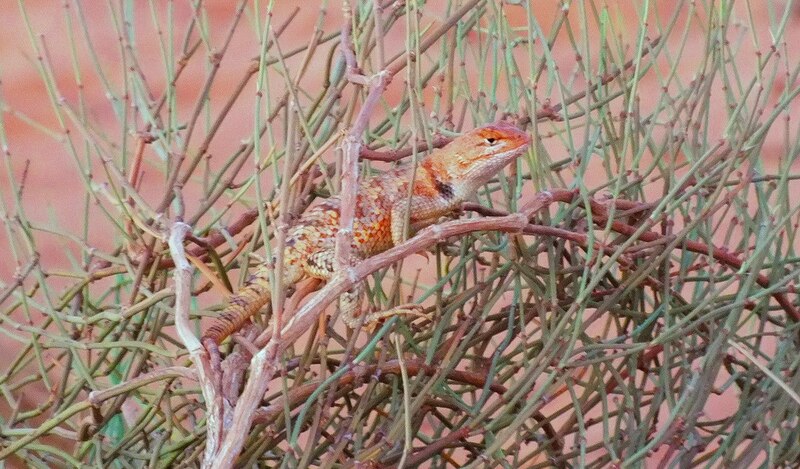 With the strength of the sun’s rays diminishing at that early evening hour, I doubt that this Desert Spiny Lizard was trying to warm its body. 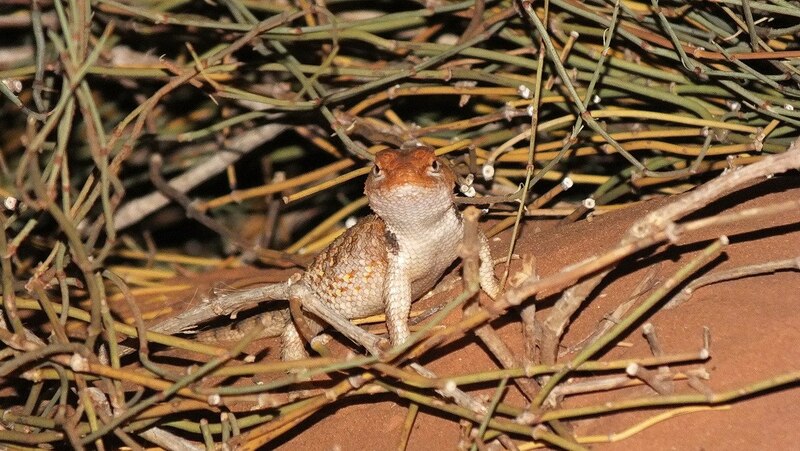 Desert Spiny Lizards eat a variety of insects, spiders, beetles and ants, so it is possible that Bob and I were interrupting its foraging before night set in. 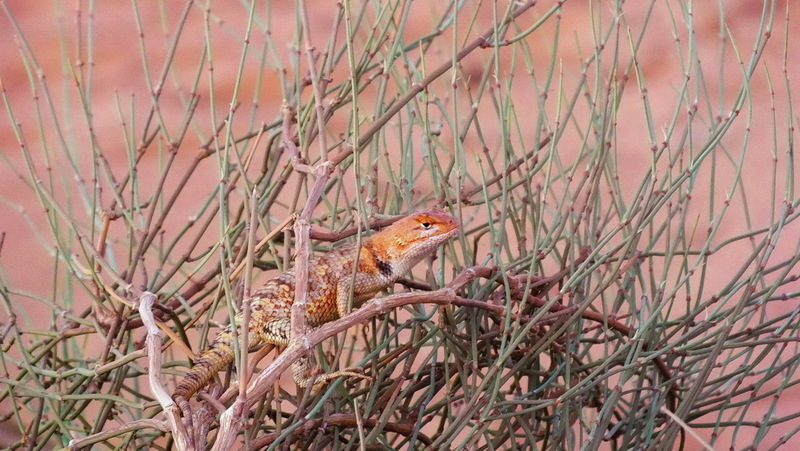 One thing we do know is that the lizard was well camouflaged where it sat on the rust-coloured bare branch. 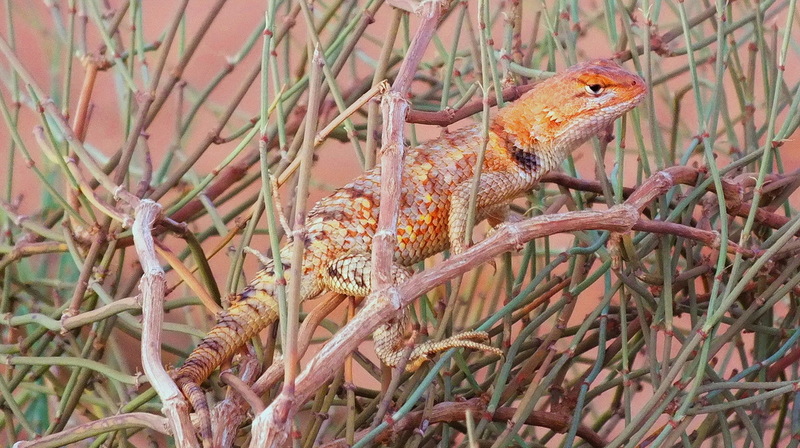 When sexually mature, a female Desert Spiny Lizard will display a more orange or even red head when it is time to breed. Bob and I observed this female in mid-June which is consistent with the breeding season which runs from May to June for this species. then we returned to admiring the impressive sunlit sandstone buttes and changing panorama as the shadows crept relentlessly upwards to cover the landscape in darkness. Wonder where the Desert Spiny Lizard spent the night. 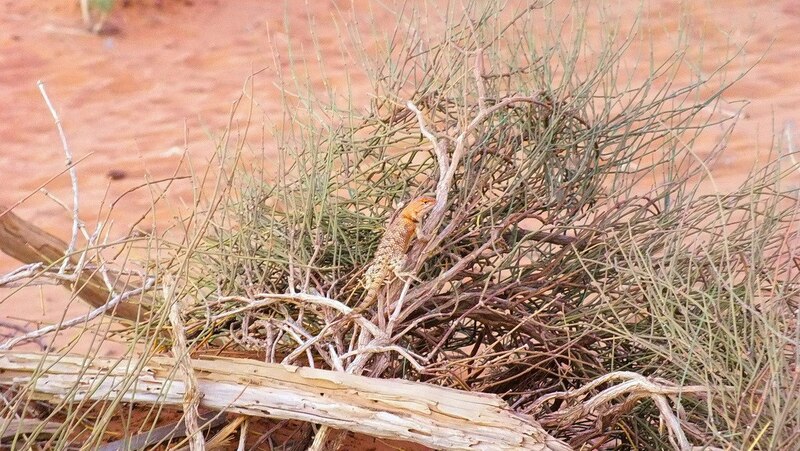 Fascinating lizard and so well camouflaged! We thought so, too, Eliza. Thank you for your interest in our blog and for taking the time to pass along a comment.